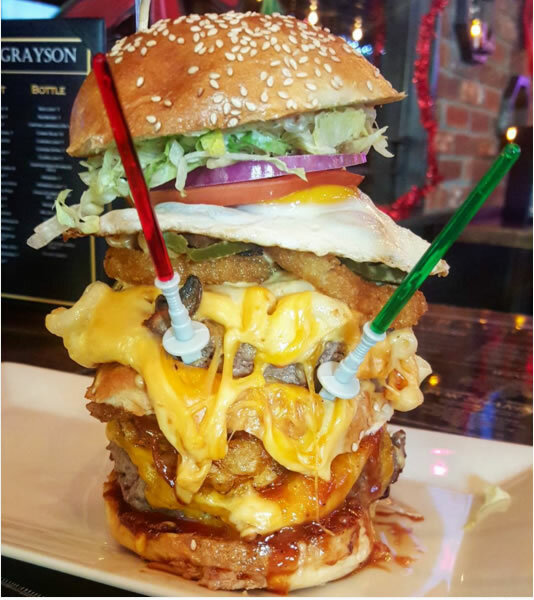 Passing this along for fans of stunt burgers, "Star Wars" and indigestion ... you just have through Thursday night (New Year's Eve!) to order The Force at The Grayson (RIP Bar Akuda) at 16 First Ave. The Force Burger ($19.95) is an off-the-menu special with: two beef patties, mac & cheese, pulled pork, bacon, cheddar and American cheeses, onion rings, mushrooms, jalapenos, a sunny-side egg and waffle fries with bacon Thousand Island and barbecue ranch sauces. The burger arrives with two souvenir lightsabers. They should have called it the Barfakuda Burger. A towering tornado of tasty turpitude? New York is becoming the deep south. The horror. How thoughtful to include 2 catheter devices. Perfect for the bro in your life.